Rochester Athletics celebrated eight student-athletes this morning, as they were surrounded by family, coaches, administration, and friends. 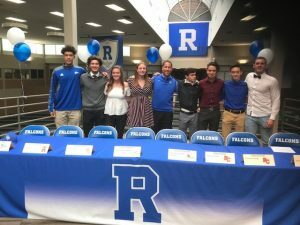 Pictured left to right: LaMarkco Gulledge (Henry Ford CC-Basketball), Luke Kastran (Kalamazoo College-Soccer), Kiley Schneck (Olivet College-Soccer), Lauren Wegener (University of Toledo-Swim), Athletic Director Luke Beach, Luciano Errecalde (Saginaw Valley State University- Soccer), Marco Gomez (Rochester College- Soccer), Tyler Sommith (Rochester College- Soccer), Martin Ivezaj (Rochester College- Soccer). Rochester saw a total of 16 student-athletes make their college deceleration this year.